Javaher Polow is the most popular Persian rice and is also known as Bride's rice! You can't deny that, look at those vibrant colours! 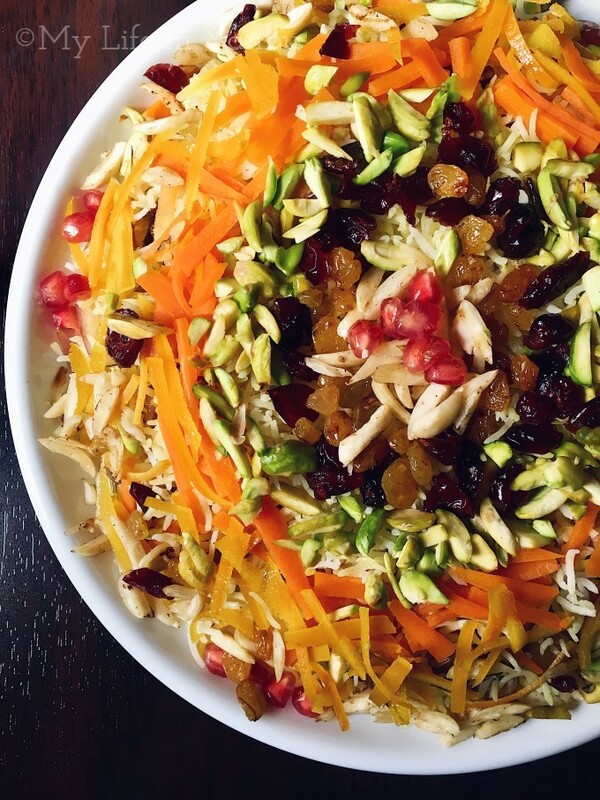 I learnt that this Persian Jewelled Rice is traditionally served at weddings and family gatherings and so this is one of the celebration food of Iran! The Scorched rice or Tah-dig is the signature Persian rice character that is commonly called the golden crust. This rice can be made without the tah-dig too. Shanaz Rafiq of Love to Cook requested for a guest post for her Guest Chef Series! What did I do for this??? I am so honoured! I chanced upon her blog through her Chicken 65 Biryani! I think I have already mentioned about her in my Cucumber Dosa post. 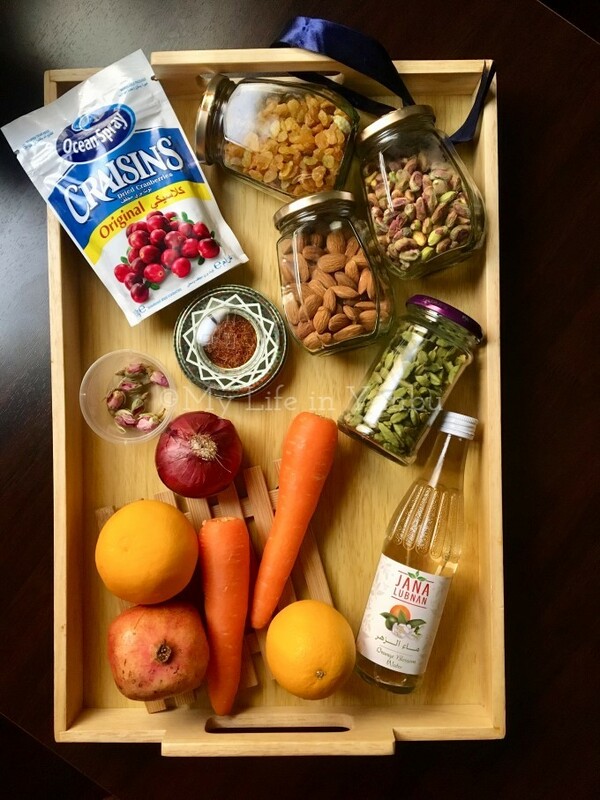 But for the new readers, her blog is a treasure trove of spicy Indian food and not to forget her amazing Youtube channel with great videos that you will find it so easy to follow! I knew she would love something from Arabic food world and so had started listing the possible ideas. One of our conversations, she suggested that I share a rice dish! I can't thank enough, it put me in so much ease! 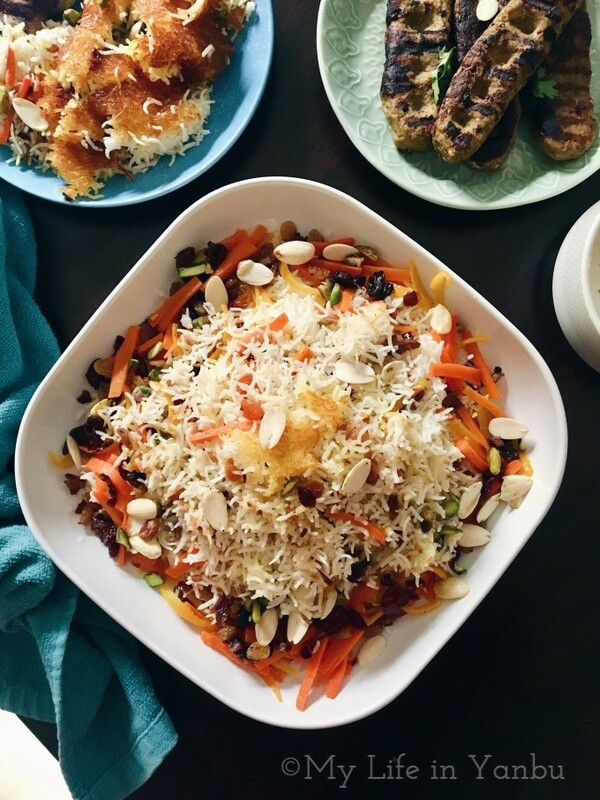 All I had to do was get to my Rice board on Pinterest and make the much-awaited Javaher Polow! The ingredients list is long and the method may sound complicated, but trust me when I say it is easy if you have some basics of making rice. I made this dish twice! The first time, for Friday lunch - the pictures all turned out hideous! And guess what, I had completely forgotten to check her blog if she already had this dish! LOL Thankfully, right after my first attempt I checked her index and was super happy to find so many other Persian recipes on her blog which will be awesome accompaniment with this rice! 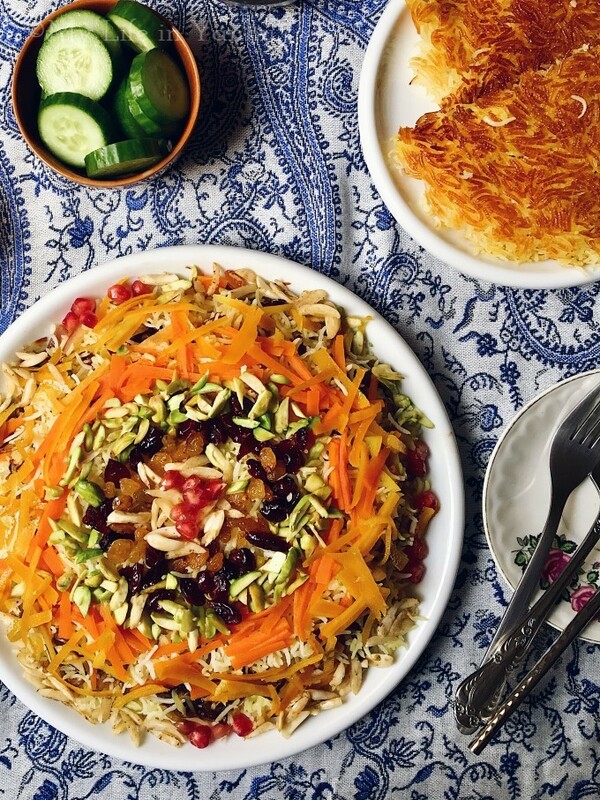 So go ahead and take a minute to visit Shanaz's website for the recipe of this celebration food of Iran, Javaher Polow and how to make Tah-dig, the golden crust of rice which is the epitome of all Persian rice! Share your thoughts, I would love to know more..